The demands of modern society often create distance between Jews and their cultural heritage. 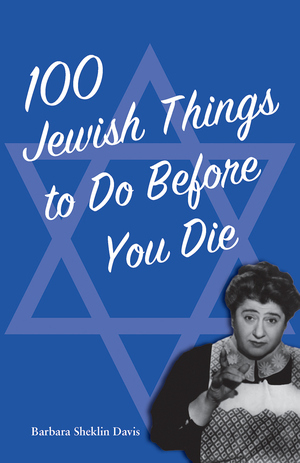 Author Barbara Sheklin Davis, a New York City native and longtime Jewish educator, offers ways to embrace and uphold Jewish influences in everyday life. Suggestions range from simple activities like indulging in a Woody Allen movie marathon and noshing on pastrami on rye to more involved activities including hosting a Shabbat dinner or exploring tikkun olam to bring about social justice and repair the world. Feeling more Jew-ish than Jewish these days? Let this list of 100 tips reconnect you! Start now with #12 and call your mother—after all, she worries! A Jewish educator for well over 50 years, Barbara Sheklin Davis has devoted her life to teaching and upholding Jewish traditions in the United States. She earned her PhD in Spanish literature from Columbia University and serves as executive editor of HaYidion, a journal of Jewish education. An accomplished author, noted scholar, and community leader, Davis received the 2015 Hannah G. Solomon Award from the National Council of Jewish Women. She is a true Jewish mother to three children and the grandmother of nine.